The NF MS-500 Series Measurement System is suitable for pre-processing analog signals and is designed for use in automated measurement applications. 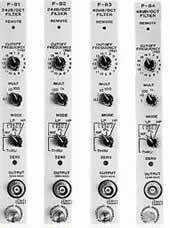 The MS-500 Series consist of a multi-channel system configured of ultra-thin plug-in units housed in a standard rack. In configuration, the MS-500 Series are composed of a mainframe which includes a power supply, a control unit and various combinations of filters, amplifiers and other functional plug-in units. Up to 16 channels can be accommodated, and GPIB control is also possible. Two types of control unit are available, the P-41 Control Unit and P-42A GPIB Unit. When using the P-41 Control Unit, one group of functional plug-in units can be controlled simultaneously using the MS-521 and MS-523 and two groups can be controlled simultaneously using the MS-525. The P-42A GPIB Unit is used to enable GPIB control of the system, with the outputs of the various functional plug-in units being transmitted after A/D conversion over the GPIB bus. It also provides such functions as control of the functional plug-in unit analog multiplexer. Connections between functional plug-in units may be made, including such connections as amplifier-to-filter and filter-to-amplifier by means of cascade buttons at the rear panel of MS-500 Series provided with such feature. This capability enables connections without the requirement of making external interconnections.